Meryl Streep is officially a Big Little Lies series regular. The acting goddess has arrived on the set of HBO’s sophomore drama in the first look at her character, Mary Louise Wright. Wright is the mother of (spoilers!) the abusive Perry Wright (Alexander Skarsgard), who was murdered in the season one finale. It is rumored that Skarsgard will still appear in season two, though. Mary Louise Wright is described as a woman who is concerned with the wellbeing of her grandchildren and searching for answers regarding her son’s death, according to THR. 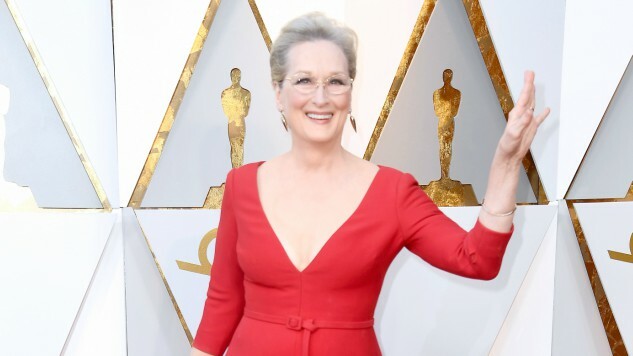 In a recent interview, acting legend Robert De Niro expressed interest in possibly playing the husband to Streep’s character in Big Little Lies—as if the cast couldn’t be any more stacked, just add Robert De Niro. The actor’s inclusion is purely hypothetical, of course, but it would surely be an interesting possibility if the series continues, since season two is now going beyond the novel upon which the first season was based. Oscar and Emmy winner Nicole Kidman posted a photo today from the set, showing her with Streep as they snuggle close with her character’s two boys. Big Little Lies is in full production mode and is expected to return in 2019. You can view some other recent sneak peeks posted by the stars from set here.